Automated Breast Ultrasound Systems Market size is set to exceed USD 1.6 billion by 2024; according to a new research report by Global Market Insights. Presence of favorable government initiatives and awareness campaigns in various countries aimed at increasing awareness levels pertaining to breast cancer and imaging modalities will escalate industry growth. Prohibitive cost associated with automated breast ultrasound systems coupled with limited awareness about ABUS in developing economies will hamper business growth. Automated breast ultrasound systems (ABUS) dominated the market with more than 50% share in 2017. Ability of these systems to detect invasive tumours in dense breasts along with increased sensitivity over mammography are major factors contributing towards business growth. Automated breast volume scanners business is poised to be the fastest growing segment owing to its ability to reduce subjectivity with ultrasound and compare outcomes with mammographic and 3D-MRI results, transforming ultrasound into a tool for double reading and improved diagnostic precision. Hospitals business held the largest share in 2017 and is anticipated to reach a value over USD 1 billion by 2024; this is attributable to increasing adoption of ABUS in hospitals owing to its improved screening and diagnostic capabilities leading to effective disease management. Growing adoption of advanced breast cancer imaging modalities along with increasing funding for breast cancer will escalate U.S. automated breast ultrasound market size. Canadian industry is anticipated to witness significant growth by 2024 owing to high prevalence of breast cancer in the country. As per Canadian Cancer Society, more than 25,000 women were diagnosed with breast cancer in 2016 that fuels demand for advanced breast imaging modalities. 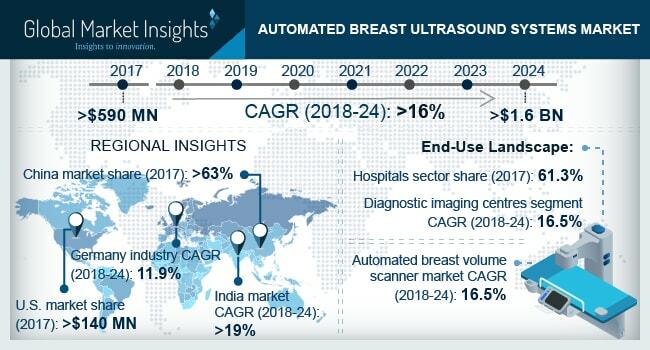 India automated breast ultrasound systems market will witness over 19% CAGR during the projection period; due to increasing prevalence of breast cancer along with increasing mortality associated with the disease. As per Indian Council of Medical Research (ICMR), over 30,000 females die from breast cancer in India every year and 1 out of 22 women is diagnosed with breast cancer in the country. Rising attention for addressing breast cancer issue will propel demand for ABUS in the coming years. Key notable industry participants in the automated breast ultrasound systems market include Siemens AG, Hitachi Ltd., GE Healthcare, SonoCine Inc., Philips N.V., QView Medical Inc. and Delphinus Medical Technologies among others. The industry players resort to new product development along with mergers and acquisitions to grab higher market share in the competitive industry. For instance, in December 2017, QView Medical received FDA approval for integrating QVCAD with the Invenia ABUS of GE Healthcare. The combined system will be used in breast screening for women with dense breast tissue whose mammogram is negative resulting into improved reading time and preserved diagnostic accuracy. Such strategies will enable the firms to strengthen product portfolio and expand customer base.